The number of sessions about virtual reality at the annual Educause conference has been steadily growing each year and the concept is now mentioned even in sessions where it is not the main topic. This year, an entire 3½ hour seminar was dedicated to Virtual Reality and the Future of Learning on the Tuesday prior to the main conference. The session organizers knew that the VR sessions would be well-attended and scheduled them for the largest possible rooms. The most-attended VR session was by Kelly Egan and Andrew Goodman, who described how VR has been integrated into the curriculum throughout Brown University. Brown has a unique 3D virtual space, called the YURT for Yurt ultimate reality theater. It is the successor to the Cave Automatic Virtual Environment (CAVE). The YURT is a space where people can share a common VR experience that is projected onto the walls and pops into 3D with the help of 3D glasses worn by the participants. During this session, faculty members described courses about creating VR content and how valuable VR has been to teaching both science and arts. Short videos illustrated how VR is used in archeology and literary arts. Andrew Rechnitz, Mellon Fellow in Digital Scholarship at Southwestern University, delivered an excellent session about how he implemented a virtual reality game to introduce new students to the library and library sciences. 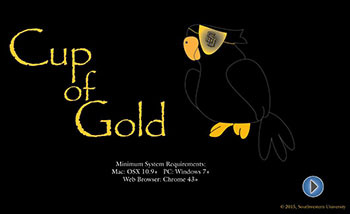 The game is called Cup of Gold, a name borrowed from John Steinbeck. The first version of this game is made up of 360 degree photos of each room in the library with hotspots that teach lessons and game sequences to check on the learning. Many memorable characters are introduced and share valuable information during the exploration. Those who successfully complete the game win half-price coffee for a semester. The first version of the game took Andrew three months to research and design with Pano2VR development software. During its first year, 420 students tried it out and 20% completed it to win the prize. The completion rate went up dramatically in the second year, when Andrew was able to reduce the average time to complete from 45-60 minutes down to 30 minutes by doing things like making some of the hotspots larger. A second version, which will make use of a more immersive virtual reality, is currently in design using the Unity platform. Four new technologies for education were summarized and discussed in an engaging interactive style that should be used more often, especially in the classroom. The session “Coding, Gaming, IoT, and Wearables: New Student Success Technologies, or Chocolate-Covered Broccoli?” included instant audience polling to assess the audience skills and the conclusions they drew from the discussions. Kahoot was the polling platform used. Unfortunately, the results of the audience polls were a little discouraging. Asked to categorize each of: coding, gaming, IoT, and wearables into categories of: ready for the classroom now, needs more research, or chocolate-covered broccoli (that is, not a good idea at all), between 30 and 50% of the audience rated the various technologies as still needing more research. This is in spite of the fact that each has already been successfully and consistently used in classrooms around the world. Future Educause sessions are needed to better share these successes. Another view of the image at the top, which was drawn just outside of the Educause 2016 conference in Anaheim, California.